Fall is a tricky time of year to stay healthy. It’s that “should I bring a jumper, jacket, umbrella, suntan lotion, all of the above” time of year where anything can happen! One day you are caught in a downpour, the next you’ve got your fluffy socks on only to wake up the following morning to blue skies and a warmer breeze. So much change and uncertainty is hard for the body to cope with, and you’re more susceptible to illness during this transition between seasons. Learn how to stay healthy year-round with a complimentary consultation. Fall is known as Vata season in Ayurveda. The cold, dry, rough and windy weather of fall aggravates Vata dosha and can bring about some unwanted ailments such as insomnia, fatigue, anxiety, constipation and gas. So how to stay balanced this fall? Ayurveda takes the whole body into account and it’s never a one size fits all approach. Make sure to check out our previous post on our tips to stay balanced in fall, and also consider going through our fall cleanse. Herbs are another piece of the puzzle to support health and vitality throughout the seasons. Let’s take a look now at the top five essential herbs to stay balanced in fall. 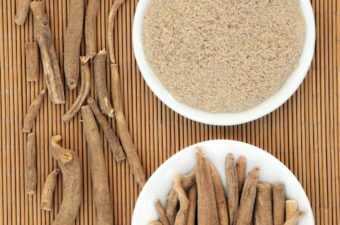 When it comes to fall, ashwagandha is usually top of the list of Ayurvedic herbs. It is considered one of the best herbs for balancing Vata dosha, and helps combat the effects of change and transition on the body. In fall, anxiety tends to creep in. A heavy, grounding and nutritive herb, ashwagandha helps calm the nervous system and relieve those jittery “hyper” feelings. 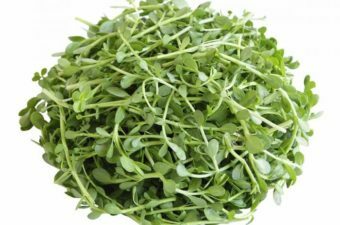 It’s an adaptogenic herb, meaning it helps the body cope with stress and can even reduce cortisol levels. As well as anxiety, insomnia is another common symptom of high Vata in fall. Trouble tossing and turning at night? Find yourself lying awake for hours on end with a head full of worries? Allow warming and comforting ashwagandha to help you relax and unwind in the evening. This herb is considered a nourishing nervine, meaning it soothes irritated nerves so you can feel more relaxed and get better quality sleep. Add the powdered form to some warm milk with a pinch of nutmeg to make it even more effective. Ayurveda’s most famous formula, triphala means “three fruits.” It’s used to maintain a healthy digestive tract and keep elimination regular. It has a very mild laxative effect, helping wake up sluggish bowels and reduce constipation. Its stool softening abilities also means it can be used to prevent and reduce haemorrhoid flare ups that tend to be more common at this time of year. Triphala is a rasayana herb, meaning not only does it help restore digestive function, it also has rejuvenative qualities and nourishes all the tissues of the body. It is well known for its antioxidant content and can be used in many ways including homemade mouthwashes and eye rinses. Triphala can be taken in either powder or capsule form. It is best taken on an empty stomach either first thing in the morning or before bed. With all the change and transition in fall, you may notice that your digestive system is sensitive to these changes too. A tell-tale sign of digestive disturbance at this time of the year is constipation. Vata season is characterized by dryness so ensure you drink ample fluids to stay hydrated and include more oils like ghee in your diet. Another warning sign of imbalanced digestion is embarrassing gas and bloating. If you feel you are passing gas more frequently recently, it may be time to consider hingvastaka churna. This traditional Ayurvedic formula is perfectly suited to balancing digestion in the fall. It simulates your digestive fire, known as agni, and combats constipation, gas and bloating. Anxiety also tends to creep in during fall as Vata dosha becomes aggravated. A warm mug of spicy hingvastak churna also helps settle a nervous stomach. Its pungent taste eliminates toxins from the digestive tract too! Have as a hot brew or sprinkled on food. A blend of almost 30 herbs combined to form a thick, sweet, nutritive jam, chyavanprash is the perfect immune booster for fall. Its main function is to increase your body’s immunity and resistance against infectious diseases. It specifically supports the lungs, nourishing the mucus membranes. If you feel a chesty cough coming on, or the dry fall air is irritating your breathing, consider trying chyavanprash. It stimulates agni and will keep you feeling warm and cosy throughout this chilly season. Melt a spoon of chyavanprash in a cup of warm milk which will carry its rejuvenating ingredients deep into the tissues, or have it spread on toast for a hearty breakfast or quick snack. Shatavari is well renowned for its nourishing and tonifying effect on the reproductive system, particularly if you are prone to irregular or painful menstruation. It also serves a very important purpose in fall. As mentioned, fall tends to be the driest time of the year. You’ve probably noticed this in your own body. Is your skin a bit drier recently? What about your hair? Are your joints cracking? Do you have a dry cough? All of these are signs that you need some internal moisturizing! Shatavari is a soothing demulcent, meaning it coats and protects mucous membranes, particularly in the digestive and respiratory tracts. It also builds strength, nourishes the blood and boosts immunity and vitality. 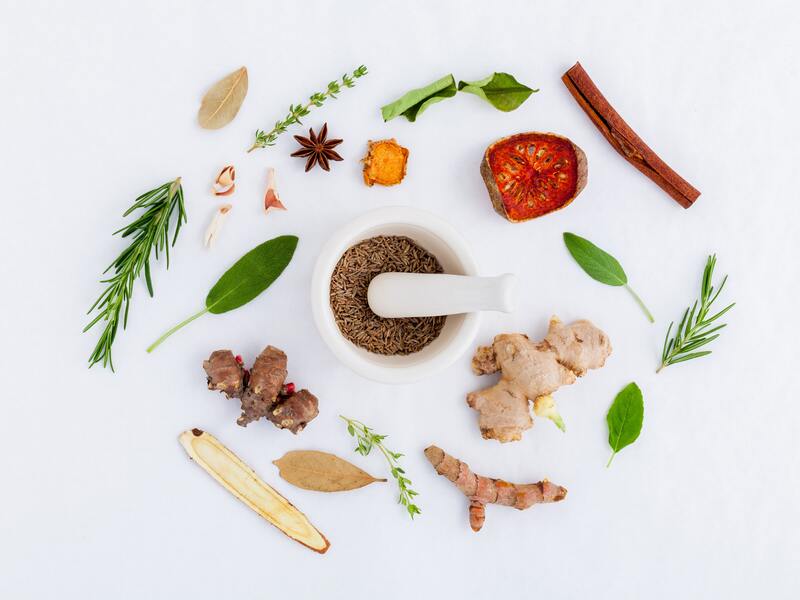 Remember, herbs are just one part of an Ayurvedic lifestyle. 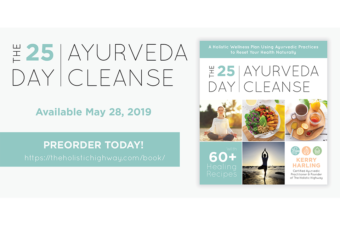 To learn how you can stay balanced throughout the seasons, don’t forget to schedule your complimentary consultation today with CEO & Ayurvedic Practitioner Kerry Harling!